BEFORE: Fast forward 30 years to the next Best Picture winner on the list, Midnight Cowboy. Of note is this is the only X-rated film to win Best Picture. Another tidbit, the rating was then downgraded to an R rating in 1971. And for those wondering, the X rating was changed to the current NC-17 rating in 1990. AFTER: Midnight Cowboy takes place in three different states, yet it doesn’t feel like the story goes anywhere at all. 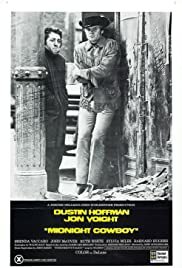 First, Joe Buck (Jon Voight) leaves Texas and then he wanders around New York City for most of the film until he leaves for Florida with his friend Enrico “Ratso” Rizzo (Dustin Hoffman). The events that take place make sense based on the characters, but there’s no real sense of progress or advancement. I understand that’s part of who Joe Buck is, (he can’t seem to make it at all in the city and keeps getting turned down by everyone) but the story itself should still progress. Buck can be stuck in a rut but the events going on around him could be escalating and as a result he needs to do something quick. Something, anything, that makes the viewer want to keep watching. The flashbacks seen throughout the film have great potential. They show little snippets of Joe’s life as a child and young adult. In the beginning the flashbacks were quite intriguing and had me wanting to find out more about this character. But the flashbacks raise more questions than they answer. And the amount of information actually revealed, while quite significant to Joe’s character and the story, could easily have been brought up in the present day. In fact it was brought up by his Ratso, raising yet more questions as to why the flashbacks are necessary.